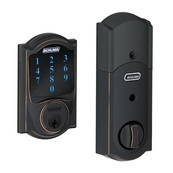 Schlage's Touchscreen Deadbolt with Alarm combines our best security features into one lock. Grade 1 certification, Anti-pick shield, Built-in Alarm technology, Remote access and notifications. Tough features with updated designs and an innovative touch screen deliver sophisticated keyless entry marrying security and convenience. 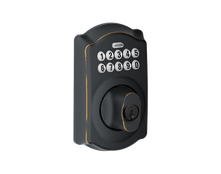 The Schlage Home Keypad Deadbolt Lock gives you the ability to monitor and manage who’s accessing your lock, by using assigned codes for housekeepers, service staff or a babysitter. Set your home automation controller to notify you when a certain teenager gets home with a quick text or email alert. Smart home technology and Schlage help you strengthen home security with America’s most trusted lock and convenient remote access from most web-accessible computers, tablets or smart phones. 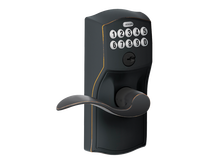 The Schlage Home Keypad Lever Lock gives you the ability to monitor and manage who’s accessing your lock, by using assigned codes for housekeepers, service staff or a babysitter. Set home automation controller to notify you when a certain teenager gets home with a quick text or email alert. Smart home technology and Schlage help you strengthen home security with America’s most trusted lock and convenient remote access from most web-accessible computers, tablets or smart phones.